Purpose: To prepare gold foil in usable form, quickly and with the least amount of handling. 1. Wash and dry hands thoroughly. 2. Spread out a clean towel. 3. 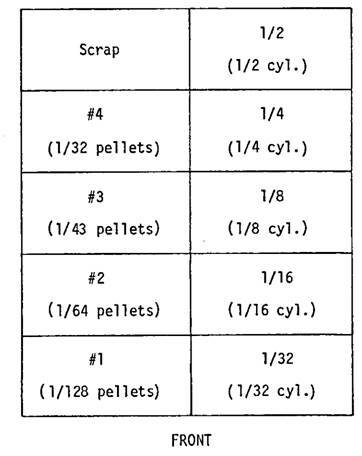 Using the pellet or cylinder guide, as the case may be, rule the book of foil for the required size of pellet or cylinder, being sure to leave a 1/8" border on each side and end of book. 4. Place paper clips on either side of book above ruled line, to hold the foil in place while cutting. 5. Hold the book firmly between fingers while cutting to prevent the foil leaves from buckling. So the gold will not be exposed to dust, do not cut too many sections at once. Cut the gold on to the towel. Remove the interposed layers of paper. 6. If there is an interruption during the rolling of gold, be sure to cover the gold and close the gold box. An accident may befall the gold, or dust or moisture settling on its surface will contaminate the foil. Contaminated foil is useless. 7. Keep an adequate supply of each size of pellet and cylinder on hand. Keep a reserve supply of each size in separate bottles. 8. Keep instruments issued for gold foil specifically for that purpose only. 1. With foil pliers, pick up a piece of gold at its center, and place it between the thumb and first two fingers of the other hand. 2. Then holding the gold loosely with the fingers, turn in the corners with the pliers, thereby concealing all edges. 3. Gently roll the gold into a loose round pellet. 4. Place the pellet into its correct section of the gold box or in the reserve bottle. 1. Fold a second towel three or four times to form a thick pad. 2. Using the pliers, place a strip of gold on the pad. 3. With the knife, crease and fold gold lengthwise, a shade less than half. Avoid creasing the foil with too much pressure which would work-harden the gold. 5. With pliers place the strip on the heel of the left thumb and hold the end lightly with the left forefinger. 6. Engage the loose end with the cylinder fork and roll the foil, forming the gold into a cylinder. Do not roll gold in the palm of the hand. This area is more subject to perspiration which contaminates the foil. 7. Slide the cylinder off the fork with the thumb and forefinger. 8. To prevent the cylinder from unrolling, gently pinch the ends with the pliers. 9. Place the cylinder in its correct section in the gold box. 10. Cylinders are used in lesser quantities than pellets, consequently a smaller supply will suffice. a. The number of folds in a cylinder will vary with the size of cylinder, and with the length desired in any specific case. 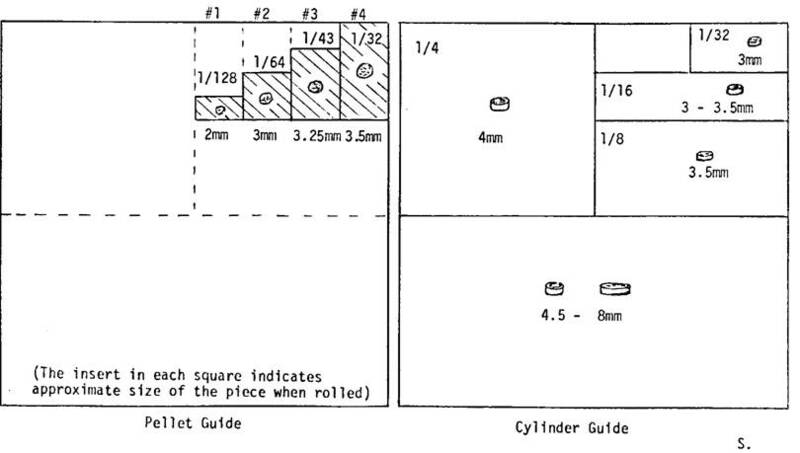 Foil for a 1/2 will be folded over on itself or halved about 4 times; a 1/16 will usually be halved once, then folded into thirds for proper length of the finished cylinder. A 1/16th to be used to line the wall of a Class 5 cavity will be folded more, and, therefore, be shorter, than will a 1/16 needed for the proximal surface of a Class 2. In each case, manage the folding so that in the finished cylinder the original edge of the gold is not exposed. b. The diameter of the core of the rolled cylinder will vary with the type of cavity in which it will be used. One to be used in a Class 2, will be rolled on a smaller cylinder form so as to have a minimal hole through the center. One to be used on the wall of a Class 5 cavity will be flattened out in placing and only by having a large core can this be accomplished and have a uniform bulk of gold along the entire wall. 1. Be sure it is free of dust and foreign material. 2. Mark it in some way so you may readily identify the bottom side, so it will not be opened improperly. 3. Make labels of adhesive tape, for the back wall of each compartment. Type the proper size designation or number on each label. 4. Label the compartment as in the sketch below. 5. A cotton pellet moistened (and then damp-dried) with 28% ammonia should be placed in each section of the box every two weeks, or more often if so indicated by the harshness of the gold. Do not place the pellet in contact with the label or it will stain and be unsightly. Remove the previous pellet of cotton. The above lists, instructional materials & recommended readings have been prepared by Dr Gerald D Stibbs and the members of the George Ellsperman Gold Foil Seminar. They have been used be the George Ellsperman Gold Foil Seminar for our instructional manual and course materials over the years. Some modifications have been made from the original list by the members of the GEGFS, but they are largely the work of Dr Gerald D Stibbs. The Digital edition has been the work of the George Ellsperman Gold Foil Seminar under the direction of Dr. Bruce B Smith.